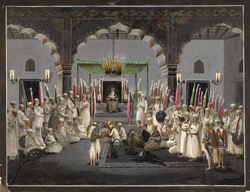 Asaf al-Daula, Nawab of Awadh from 1775 to1797, ordered the construction of the Great Imambara in 1784 for the purpose of celebrating the Muslim festival of Muharram. The Muharram festival is in commemoration of the imams Ali, Hasan, and Hussein. This festival starts on the 1st day of Muharram, the first month of the Islamic calendar, and lasts for 10 days. In this view, the Nawab is shown listening to the 'maulvi' reading from the scriptures in the hall of the Imanbara. Subsequently, the building was used as a mausoleum for Asaf ud-Daula upon his death in 1797.